I was offered a terrific opportunity to sample and share Mega Bloks with my moms group. We all got together with our 1 to 4 year olds and let the fun begin. 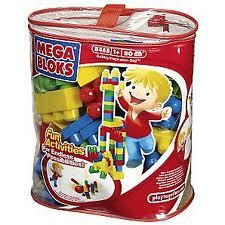 I was sent several bags of the Mega Bloks 24 piece set and we gave each child a bag. Boy did they love them. Every child immediately began playing with them and had a blast. There were many benefits we found the Mega Bloks to have. First of all the size was perfect for the younger kids in the group but the older kids loved them as well. The primary colors are great and very helpful in teaching our kids about colors. I also loved that they sparked some creativity in the kids. The younger kids just sort of stacked the blocks but the older ones made cars and dinosaurs and pretty much anything else you Can think of. I would recommend everyone has Mega Bloks to play with. They are a very fun and educational toy. They are also quite reasonably priced and as a budget conscious mom there are always coupons available for Mega Bloks.